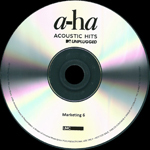 On 6 October, a-ha released an acoustic album "MTV Unplugged Summer Solistice" in Europe. The album was recorded across two nights, Thursday 22 and Friday 23 June 2017 on the tiny island of Giske close to the city of Ålesund in Norway. The shows were performed in front of an audience of 250 people. 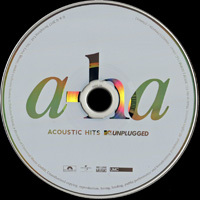 On the same date, the album "Acoustic Hits MTV Unplugged" was also released which includes a subset of individual tracks from the Summer Solistice show. 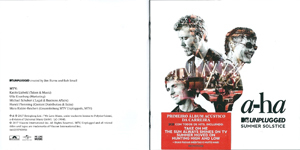 The cover of the albums are white with cut out shots of the head and shoulders of Paul, Magne and Morten. Across the overlap of the bodies, you can see a live shot of the band taken from one of the shows. The title is printed in black letters in the bottom right hand corner of the sleeve. The booklet has eight double sided pages with lots of information about the shows printed in black on the white pages plus eight coloured shots of the band performing and one shot of the band standing with Alison Moyet, one of the artists performing with a-ha. Other than the track listing on the inside cover of the booklet and the additional MTV text which is missing from Acoustic Hits, the booklets in both albums are identical. The Summer Solistice album was released in a double jewel case and also two digi-paks, one with a DVD of the show included, the other with a blu-ray of the show. 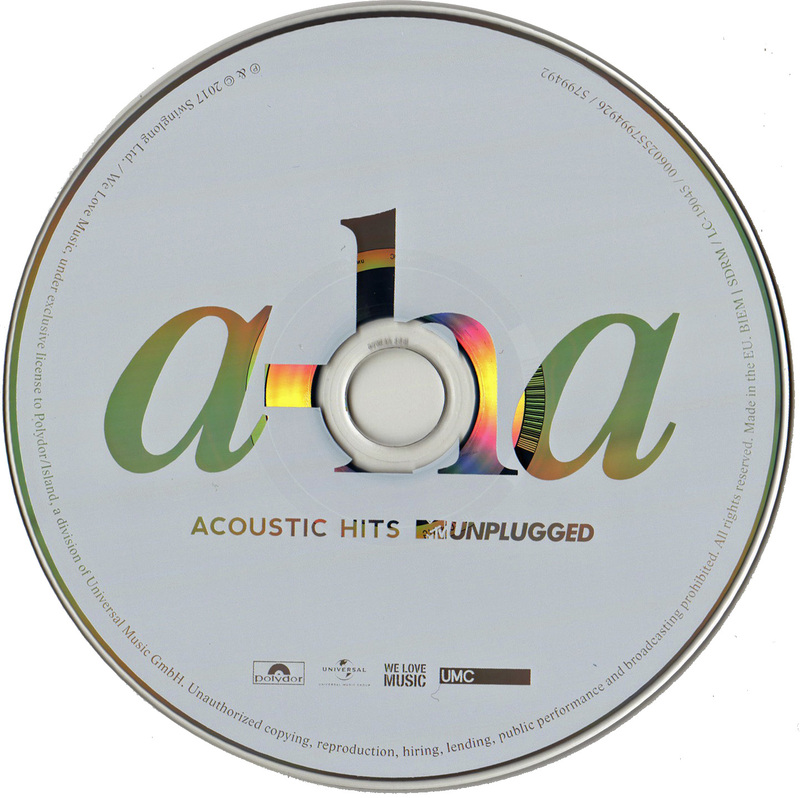 The Acoustic Hits release is a one disc release and comes in a jewel case. The jewelcase CD release comes with a red sticker rectangular sticker with white text: "FIRST TIME ACOUSTIC ALBUM 2CD WITH ALL HITS INCLUDING: TAKE ON ME THE SUN ALWAYS SHINES ON TV SUMMER MOVED ON HUNTING HIGH AND LOW + TWO BRAND NEW TRACKS AND MANY MORE! 00602557929508". The sticker on the blu-ray digipak release reads "FIRST TIME ACOUSTIC ALBUM 2CD+BLU-RAY WITH ALL HITS INCLUDING: TAKE ON ME THE SUN ALWAYS SHINES ON TV SUMMER MOVED ON HUNTING HIGH AND LOW + TWO BRAND NEW TRACKS AND MANY MORE! 00602557929584". The DVD digipak has similar wording on the sticker with the obvious slight wording and catalogue number amends. 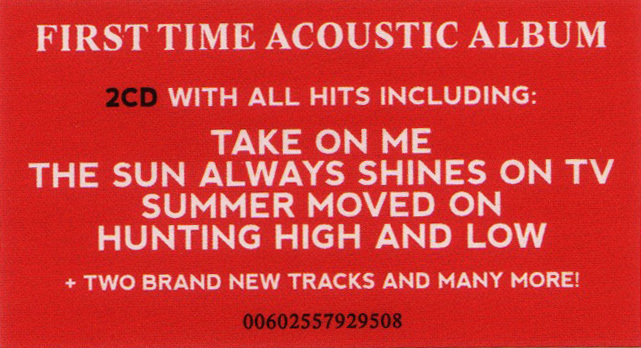 The sticker for the 1 CD Acoustic Hits release reads: "INCLUDING THE HITS: TAKE ON ME THE SUN ALWAYS SHINES ON TV THE LIVING DAYLIGHTS HUNTING HIGH AND LOW + TWO BRAND NEW TRACKS 00602557994926"
The CD features 21 tracks split across two discs including two brand new tracks (tracks 1 and 6 on disc 1). Five artist joined a-ha on stage to sing with the band, a-ha also did two cover versions, a cover of the Bridges track "Sox Of The Fox" and "The Killing Moon" with Ian McCulloch from Echo & The Bunneymen. Alison Moyet joined a-ha for "Summer Moved On" which was recorded during the daytime as Alison was unavailable in the evening. 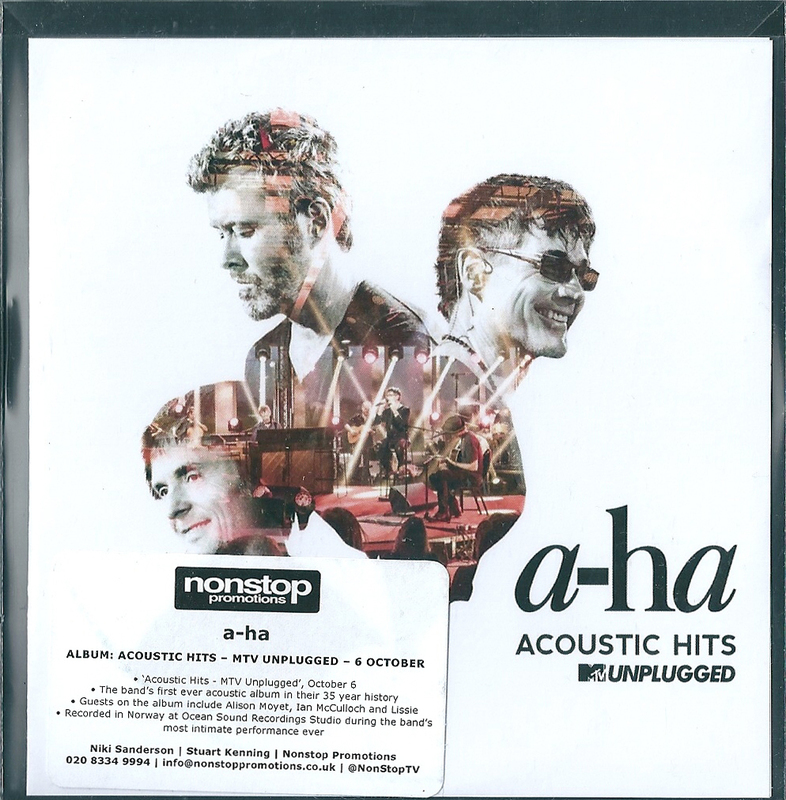 The UK promo edition of "a-ha ACOUSTIC HITS MTV UNPLUGGED" comes in a PVC sleeve with a folded paper insert. The front of the sleeve is similar to the regular album. The back sleeve is white and displays the full 15 track listing down the centre. On the lower left hand side, there is a unique marketing number for each copy. Along the bottom, there is a "UNIVERSAL MUSIC CATALOGUE" logo plus some Promotional and Watermark text; "℗ & © 2017 Swinglong Ltd. /We Love Music, under exclusive licence to Polydor/Island, a division of Universal Music GmbH FOR PROMOTIONAL USE ONLY - NOT FOR SALE. THIS CD CONTAINS A UNIQUE WATERMARK TRACEABLE TO THE RECIPIENT". On the front of the clear PVC wallet, there is a white "nonstop promotions" rectangular sticker which advertises the release date of the album, special guests and where the album was recorded. There is also some "non-stop" promotions contact names, telephone numbers and email addresses; "nonstop promotions a-ha ALBUM: ACOUSTIC HITS - MTV UNPLUGGED - 6 OCTOBER • 'Acoustic Hits - MTV Unplugged', October 6 • The band's first ever acoustic album in their 35 year history • Guests on the album include Alison Moyet, Ian McCulloch and Lissie • Recorded in Norway at Ocean Sound Recordings Studio during the band's most intimate performance ever Niki Sanderson | Stuart Kenning | Nonstop Promotions 020 8334 9994 | [email protected] | @NonStopTV". The promo comes with a silver disc with black printed text, the a-ha logo is displayed at the top with the title "ACOUSTIC HITS MTV UNPLUGGED" underneath. At the lower half of the disc, it shows the same Promotional and Watermark text as on the back sleeve, plus the same unique marketing number and "UNIVERSAL MUSIC CATALOGUE" logo. The release appears to come without a Catalogue number. The album was also released on a 3 LP set. The artwork is similar to the CD release. The LP also comes with a red sticker with white text: "FIRST TIME ACOUSTIC ALBUM 3LP WITH ALL HITS INCLUDING: TAKE ON ME THE SUN ALWAYS SHINES ON TV SUMMER MOVED ON HUNTING HIGH AND LOW + TWO BRAND NEW TRACKS AND MANY MORE! 00602557929553"
The 2CD+DVD digipak edition of "MTV Unplugged Summer Solistice" was released in Argentina; it comes with the same front cover artworks as the European edition and also includes the usual red sticker with black and white text printed in English, but without the rounded corners; "FIRST TIME ACOUSTIC ALBUM 2CD+DVD WITH ALL HITS INCLUDING: TAKE ON ME, THE SUN ALWAYS SHINES ON TV, SUMMER MOVED ON, HUNTING HIGH AND LOW + TWO BRAND NEW TRACKS ANS MANY MORE!". The Catalogue number at the end has also been changed to 5792957. 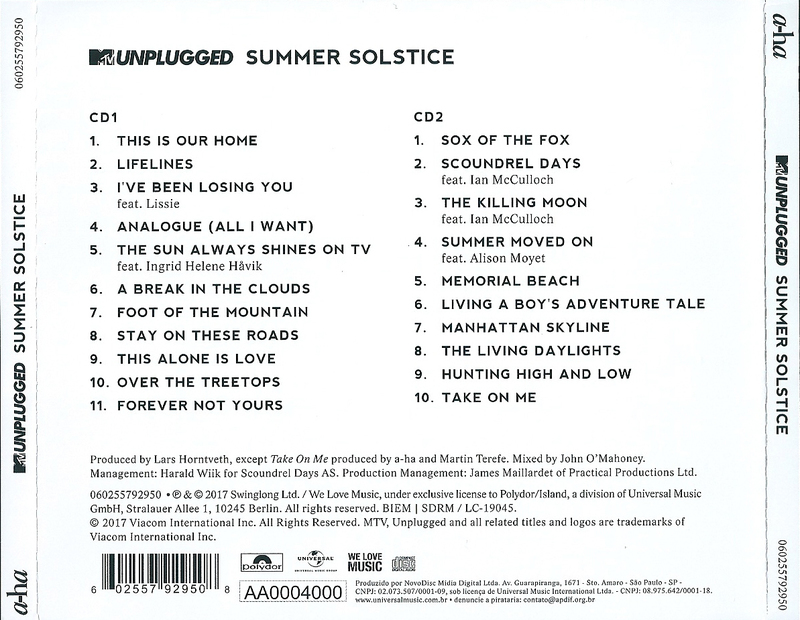 On the back sleeve, the usual title; "MTV UNPLUGGED SUMMER SOLSTICE" is displayed along the top, with the full track listing for each CD1 & CD2 listed underneath. 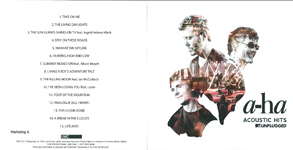 The track listing is identical to the European edition. The text; "+CONCERT DVD & BEHIND THE SCENES" is also included. At the lower half of the back sleeve, printed in a smaller font, is the usual Production & Copyright Information; "Produced by Lars Horntveth, except Take On Me produced by a-ha and Martin Terefe. Mixed by John O’Mahoney. Management: Harald Wiik for Scoundrel Days AS. Production Management: James Maillardet of Practical Productions Ltd. ℗ & © 2017 Swinglong Ltd. / We Love Music, under exclusive license to Polydor/Island, a division of Universal Music GmbH, Stralauer Allee 1, 10245 Berlin. 5792957 © 2017 Viacom International Inc. All Rights Reserved. MTV, Unplugged and all related titles and logos are trademarks of Viacom International Inc.". There is also some additional Spanish Manufacturing and Distribution text; "Publicado y distribuido por Universal Music Argentina S.A., miembro de CAPIF. Advertencia: Los titulares de la propiedad intellectual sobre las grabaciones audiovisuales, sobre las grabaciones de sonido, fotografias, disenos y restantes elementos reproducidos o incluidos en este DVD, solo han autorizado su utilizacion para su exhibicion para uso privado y hogareno. – Todos los demas derechos estan reservados. – Queda absolutamente prohibida la reproduccion o copia, edicion, comercializacion o utilizacion total o parcial de este DVD y/o de cualquiera de los contenidos reproducidos en el mismo. – La violacion a lo aqui establecido dara lugar a la iniciacion de acciones civiles y/o penales. SADAIC-BIEM-AADI-CAPIF. Industria Argentina. Disco es Cultura.". Along the bottom is the same barcode number "6 02557 92957 7" and regular "polydor" "UNIVERSAL MUSIC GROUP", "WE LOVE MUSIC", "DVD VIDEO" and "E EXEMPT FROM CLASSIFICATION" logos as the European edition. Three other additional logos; "COMPACT disc DIGITAL AUDIO", "UNA COPIA MAS UN MUSICO MENOS CAPIF" and "AADI CAPIF" have been added. On the spine, the Catalogue Number has also been amended accordingly to 5792957. 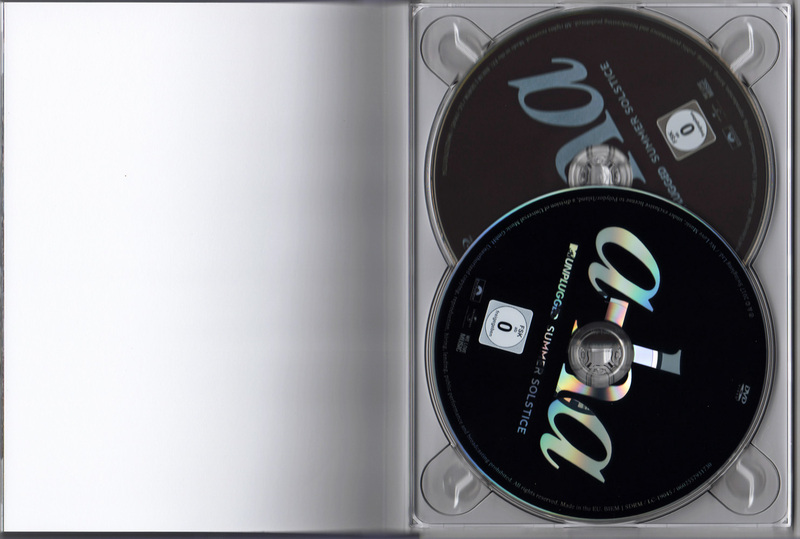 The inside of the Digipak folds out to include two white CD1 and CD2 discs, plus a black DVD disc. 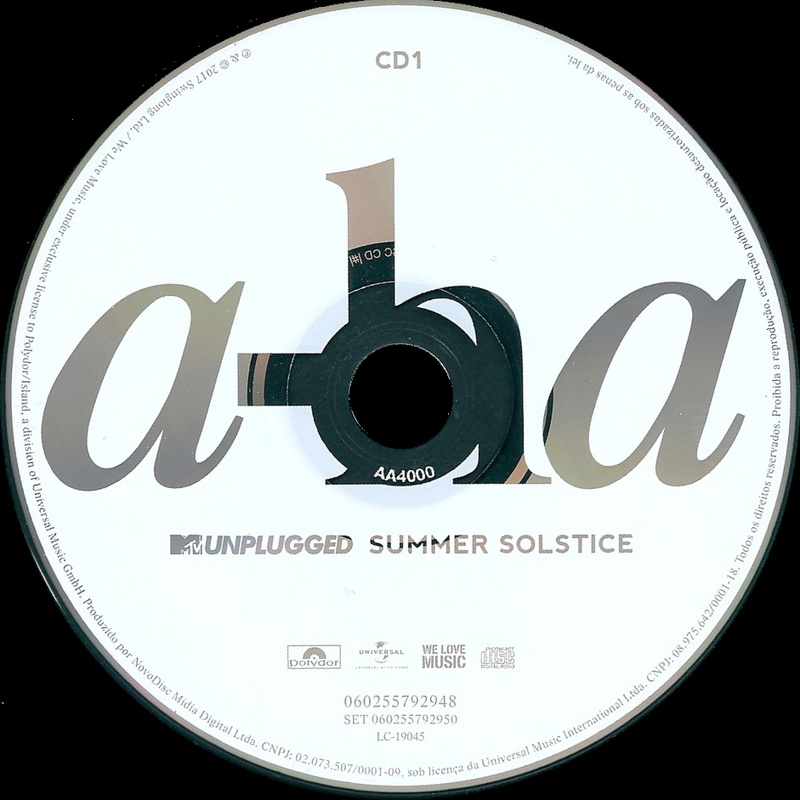 The layout of the CD discs are vertually the same as the European edition, displaying the a-ha logo in silver across the centre with the title "MTV UNPLUGGED SUMMER SOLSTICE" printed underneath. CD1 and CD2 are shown as usual at the top of each disc. The regular "polydor", "UNIVERSAL MUSIC GROUP" and "WE LOVE MUSIC" logos are included at the bottom. Like the back sleeve, two additional argentine logos "UNA COPIA MAS UN MUSICO MENOS CAPIF" and "AADI CAPIF" have been added. Around the outer edge of each CD is the regular European Production and Copyright information; "℗ & © 2017 Swinglong Ltd. / We Love Music, under exclusive license to Polydor/Island, a division of Universal Music GmbH", plus some additional Spanish Manufacturing, Distributing and Copyright text; "Publicado y distribuido por Universal Music Argentina S.A., miembro de CAPIF. Reservados todos los derechos del productor, de los autores y de los interpretes de las obras reproducidas en este ejemplar. Prohibida la reproduccion, regrabacion, alquiler, prestamo, canje, ejecucion publica, radiodifusion y cualesquiera otro uso no autorizado de estos fonogramas. SADAIC. BIEM. AADI. CAPIF. Industria Argentina. Disco es cultura. SET 5792957 / 5792948/9". 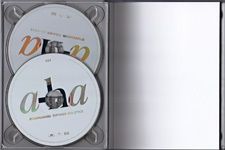 The black coloured DVD disc again contains the silver A-ha logo and title displayed in the centre. The "DVD VIDEO" symbol is included at the top with the "FSK ab 0 freigegeben" German logo at the bottom. The same logos which appear on the CD's and back sleeve are also present, plus the English and Spanish text printed around the outer edge of the DVD is the same as that on both CD1 and CD2 apart from the Catalogue Number of the DVD reads 5792951. The digipac also includes a slot to hold the regular colour European booklet and includes the quot "THIS IS OUR HOME THIS IS WHERE WE BELONG" printed in black text. There is a Brazilian 2 CD set of the "MTV Unplugged Summer Solistice" which was manufactured by "NovaDisc Midia Digital Ltda.". 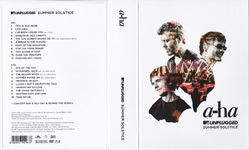 It comes with the same front cover as the European edition displaying the head and shoulder shots of Paul, Magne and Morten with the overlapping of bodies, the live shot of the band taken from one of the shows is also included. 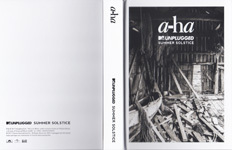 At the bottom right hand corner, the usual title "a-ha MTV UNPLUGGED SUMMER SOLSTICE" is shown in bold black letters. 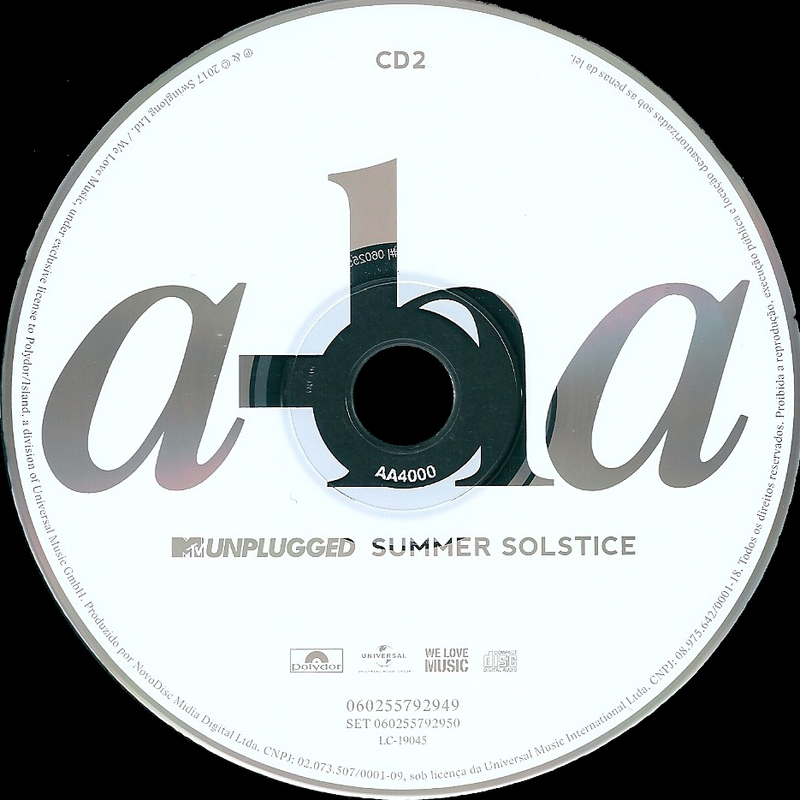 The front cover also includes a red rectangular sticker with black & white text, but the information is now displayed in Portuguese to read; "PRIMEIRO ALBUM ACUSTICO DA CARREIRA 2CD COM TODOS OS HITS, INCLUINDO: TAKE ON ME THE SUN ALWAYS SHINES ON TV SUMMER MOVED ON HUNTING HIGH AND LOW + DUAS FAIXAS INEDITAS E MUITO MAIS! 060255792950". The inside of the album includes the same colour booklet as the European edition apart from the Brazilian Catalogue number being included on the back cover. 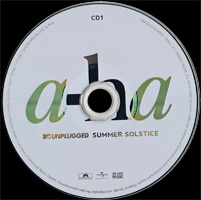 The discs themselves like the European edition are white with silver text, the a-ha logo is printed across the centre, but in a slightly larger font with the title "MTV UNPLUGGED SUMMER SOLSTICE" underneath. CD1/CD2 is shown at the top with the usual "polydor", "UNIVERSAL MUSIC GROUP" and "WE LOVE MUSIC" logos at the bottom. An additional "COMPACT disc DIGITAL AUDIO" logo has also been added, plus some Catalogue number and "LC" coding information for each disc is shown. Disc 1 reads; "060255792948 SET 060255792950 LC-19045", whilst Disc 2 reads; "060255792949 SET 060255792950 LC-19045". Displayed around the outer rim of each disc is some Brazilian Production & Copyright text; "℗ @ © 2017 Swinglong Ltd. / We Love Music, under exclusive license to Polydor/Island, a division of Universal Music GmbH. Produzido por NovoDisc Midia Digital Ltda. CNPJ: 02.073.507/0001-09, sob licence da Universal Music International Ltda. CNPJ: 08.975.642/0001-18. Todos os direitos reservados. Prohibida a reproducao, execucao publica e locacao desautorizadas sob as penas da lei." On the back sleeve, the layout including the track listing is the same as the European edition showing the standard Production & Copyright text in English. At the bottom of the black sleeve, the standard European barcode "6 02557 92950 8" with the usual "polydor", "UNIVERSAL MUSIC GROUP" and "WE LOVE MUSIC" logos are also displayed. An additional "COMPACT disc DIGITAL AUDIO" logo has again been added, along with some additional Brazilian manufacturing information and two website addresses; "Produzido por NovoDisc Midia Digital Ltda. Av. Guarapiranga, 1671 – Sto. Amaro – Sao Paulo – SP – CNPJ: 02.073.507/0001-09, sob licence de Universal Music International Ltda. – CNPJ: 08.975.642/0001-18. www.universalmusic.com.br • denuncie a pirataria: [email protected]". The Catalogue number on both the spine and back sleeve has also been changed to 060255792950, plus there is also some additional batch issue coding displayed on the back sleeve and around the actual centre rim of each disc. There are at least two different copies known to exist AA0004000 & AB1000. 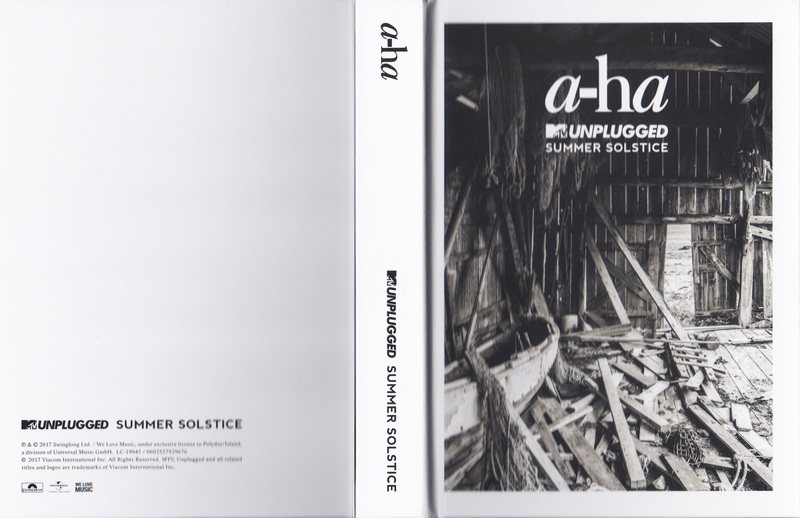 A limited edition "a-ha MTV Unplugged Summer Solstice" fan box set was released in Germany. It comes in white box 15 x 20 x 4 cm. The front of the box is printed with similar design to the CD art work. The back of the box has production, copyright information, company logos and bar code printed at the bottom. Over the top of this is a paper sheet, stuck to the box only in the centre. It includes the CD track listing and the same production and copyright information. The box is hinged down the left hand side. Inside is a hardback book which fits snuggly inside the box. In the front of the book are the two CD discs of the same design as the two CD set but with different catalogue number. The DCD and Blu-ray are housed in the back of the book, again similar to the European release, although the text on the Blu-ray is more of a metallic blue colour. The book has 26 double sided pages with lots of photos from the rehearsals and the MTV show plus text similar to that in the CD booklet, The front of the book features a shot of the inside of a wooden boat shed with lots of wood spread across the floor. The title is printed in white at the top. 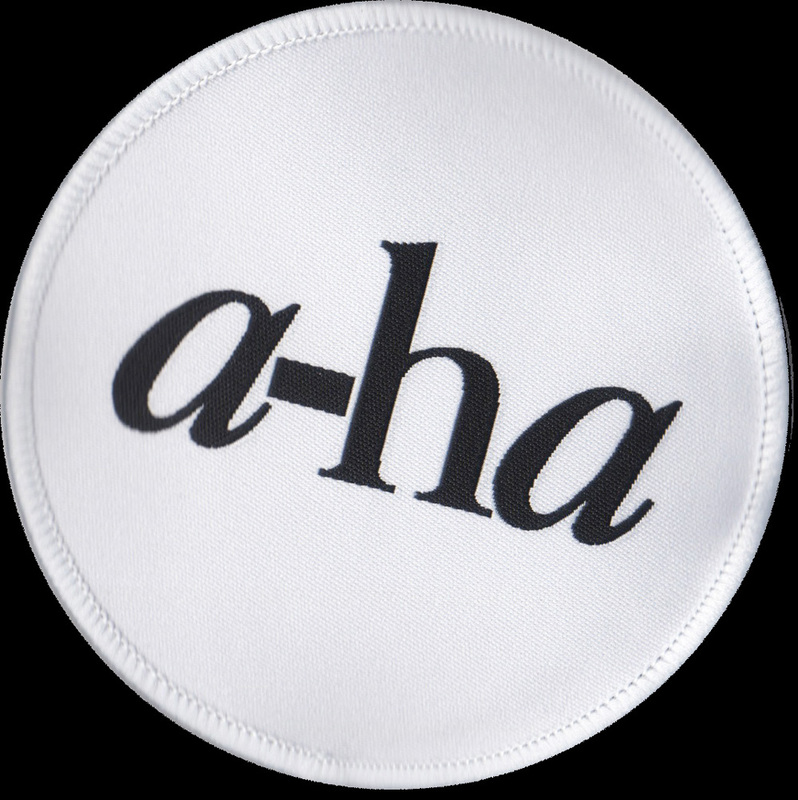 The box also includes a large folded poster of the band, a circular white patch with a-ha in black, a rubber wristband with "a-ha MTV Unplugged Summer Solstice" printed in white, plus a black circular pin badge, again with the title printed in white. 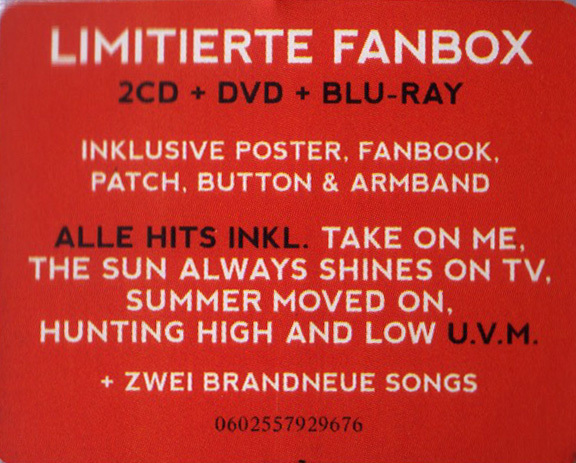 On the front of the box is a red sticker with the text "LIMITIERTE FANBOX 2CD + DVD + BLU-RAY INCLUSIVE POSTER, FANBOOK, PATCH, BUTTON & ARMBAND ALLE HITS INKL. TAKE ON ME, THE SUN ALWAYS SHINES ON TV, SUMMER MOVED ON, HUNTING HIGH AND LOW U.V.M. + ZWEI BRANDNEUE SONGS 0602557929676". 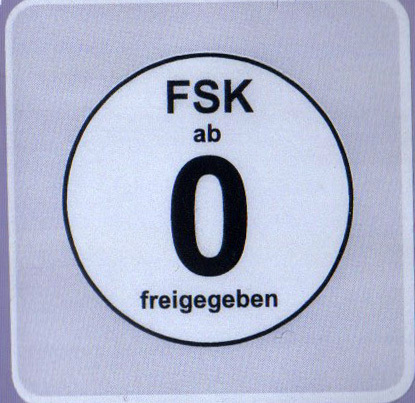 There is also a small white sticker with the text "FSK ab 0 freigegeben" inside a black circular ring. The Polish jewelcase 2CD release of "a-ha MTV UNPLUGGED SUMMER SOLSTICE" is very similar to the European edition displaying the regular artworks, but it doesn’t include the additional red sticker on the front of the CD case. On the back sleeve, the usual title and regular full track listing is shown for both CD1 and CD2. The lower half of the sleeve comes instead with some slightly amended Manufacturing, Production and Copyright text to include a Universal Music Poland contact address; "Produced by Lars Horntveth, except Take On Me produced by a-ha and Martin Terefe. Mixed by John O’Mahoney. Management: Harald Wiik for Scoundrel Days AS. Production Management: James Maillardet of Practical Productions Ltd. ℗ & © 2017 Swinglong Ltd. / We Love Music, under exclusive license to Polydor/Island, a division of Universal Music GmbH, Stralauer Allee 1, 10245 Berlin. All rights reserved. Made in the EU. BIEM | SDRM / LC-19045 / 670 919 8 © 2017 Viacom International Inc. All Rights Reserved. MTV, Unplugged and all related titles and logos are trademarks of Viacom International Inc. Universal Music Polska Sp. z o.o. Nagrania Muzyczne, ul. Wlodarzewska 69, 02-384 Warszawa. tel. 22 592 82 00". At the bottom left hand corner, the barcode number "6 02567 09198 1" on display is different compared to the European edition, although the "polydor", "UNIVERSAL MUSIC GROUP" and "WE LOVE MUSIC" logos have been included as normal. The Catalogue Number on the spine has also been changed to 670 919 8. 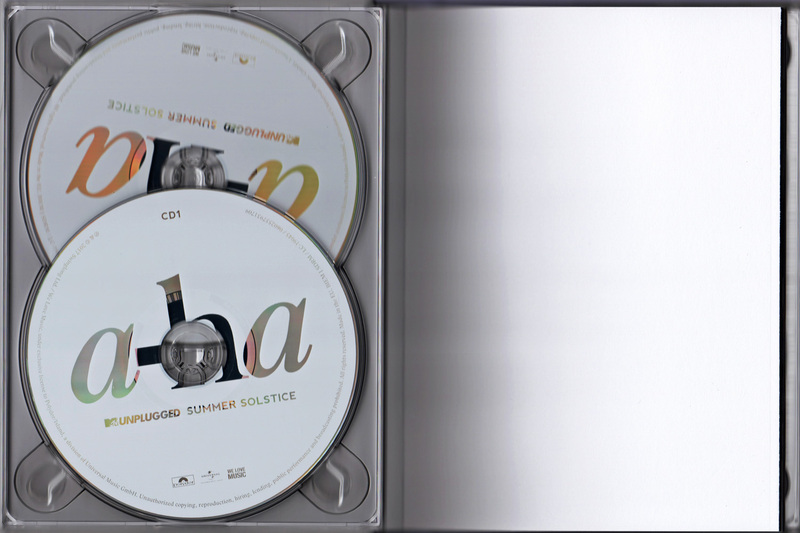 There is a Russian jewelcase CD set of "A-ha MTV UNPLUGGED SUMMER SOLSTICE" which is very similar to the European release showing the usual artworks and full album title. On the front sleeve, the regular red sticker is included displaying the same black and white text; "FIRST TIME ACOUSTIC ALBUM 2CD WITH ALL HITS INCLUDING: TAKE ON ME THE SUN ALWAYS SHINES ON TV SUMMER MOVED ON HUNTING HIGH AND LOW + TWO BRAND NEW TRACKS AND MANY MORE!". The Catalogue number at the bottom of the sticker has been changed though to 4605026717619, plus the stickered corners are rounded rather than square. The front sleeve also contains a silver square hologram sticker displaying the "Universal Music Ltd" logo with the same text printed underneath in Russian "ООО ≪Юниверсал Мьюзик≫". There is also some "AE 311400" coding included in Black. 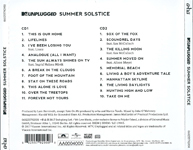 The back sleeve comes again with a similar layout displaying the black title "MTV UNPLUGGED SUMMER SOLSTICE" along the top with the full track listing to each CD underneath. Some of the regular Production and Credits Information is included in English; "Produced by Lars Horntveth, except Take On Me produced by a-ha and Martin Terefe. Mixed by John O'Mahoney. Management: Harald Wiik for Scoundrel Days AS. Production Management: James Maillardet of Practical Productions Ltd.", although some addition Russian Record Company and Copyright text has also been added; "℗© 2017 Swinglong Ltd. / We Love Music, under exclusive license to Polydor/Island, a division of Universal Music GmbH, Stralauer Allee 1, 10245 Berlin. © 2017 Viacom International Inc. MTV, Unplugged and all related titles and logos are trademarks of Viacom International Inc. ©℗ ООО ≪Юниверсал Мьюзик≫ 2017., Россия, 121170, г. Москва, Кутузовский проспеспект, д.36, строение 23. Изготовители: ООО ≪Лазер Крафт≫ 620137, Свердловская область, г. Екатеринбург, ул. Студенческая, д. 9, литер А, этаж 1, офис 74/1, лицензия №77-375 от 18.09.2015г. ООО ≪Хай-Тек Медиа Клуб≫ 129090, г. Москва, Щепкина ул., д.28, лицензия №77-340 от 20.12.2010 г. фонограмма предназначена для частного прослушивания. Иное использование без разрешения правообладателя запрещено. Компакт-диск формата CD-DA. Содержит музыкальную. запись. Не подлежит обязательной сертификации. Соответствует стандарту Red Book (Красная Книга), стерео. Не подвергать механическому воздействию. Лицензионный диск, произведенный в России, для распространения на территоории СНГ, исключая территорию Молдовы. Все права защищены. www.facebook.com/universalmusicrussia". Along the bottom of the back sleeve, the barcode at the bottom left hand corner has been set out slightly differently compared to the European release, to display the number in two parts 4 605026 717619. The regular "Polydor", "UNIVERSAL MUSIC GROUP" and "WE LOVE MUSIC" are additionally included. The inside of the CD comes with the standard European colour booklet displaying the regular show text and artwork, but the Catalogue Number of the back cover has been changed accordingly to 4605026717619. 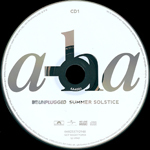 The discs themselves are coloured the usual white with the large a-ha logo printed across the centre and title "MTV UNPLUGGED SUMMER SOLSTICE" in silver. Around the outer rim of each disc is some English and Russian Production and Copyright text which is similar to the back sleeve; "℗© 2017 Swinglong Ltd. We Love Music, under exclusive license to Polydor/Island, a division of Universal Music GmbH. ©℗ ООО ≪Юниверсал Мьюзик≫ 2017. Все права защищены. фонограмма предназначена для частного прослушивания. BIEM SDRM / 4605026717619".